Overview: West Fork #24 is a 6.8 mile (according to the Forest Service...) segment of the Arizona Trail that winds through Sabino Basin and connects several popular front range trails in the Pusch Ridge Wilderness. While it is probably best known as a popular access point to Hutch's Pool, experienced hikers can take advantage of West Fork #24 to connect multiple trails and create their own unique route through the wilderness. Hike: This summary will describe the trail as hiked from East to West as this is likely the most common route, often hiked by those intending to reach Hutch's Pool. Starting from the junction with Sabino Canyon #23 and East Fork #24A the West Fork #24 takes off Eastward and immediately crosses a large wash that spills out of Box Camp Canyon. This crossing was well cairned and bone dry in late April when I crossed it, however I imagine it could be difficult to cross after recent rain. After crossing the wash the trail begins to gradually descend through a hilly area as it approaches and soon arrives on the North bank of the West Fork. From here, this gentle section of trail begins to wind its way along the banks of the West Fork, imperceptibly gaining elevation as it works its way towards Hutch's Pool. Just prior to reaching Hutch's Pool the trail will cross over to the South side of the West Fork for the first time where it will pass a small unmarked spur trail that leads to a large pool along the banks of the West Fork. Don't be fooled by this turn off, Hutch's Pool is still a few minutes ahead and is marked by a well cairned junction that is nearly impossible to miss. Having hiked 1.6 miles to this point, a short 5 minute stroll down to Hutch's pool will reward you with access to a year-round swimming hole and a nice place for a quick break. After departing Hutch's pool, the last reliable water source on this hike, the trail immediately begins to switchback up the hillside allowing you to look down on the West Fork and Hutch's Pool. Once at the top of the switchbacks the trail will begin to contour along the hillside while remaining fairly level. Occasionally you will be rewarded with glimpses of the West Fork below and hear the sound of water as it flows towards Sabino Canyon, other times you will find your view of the West Fork obscured. Eventually you will reach another series of switchbacks and quickly descend back down to meet the West Fork again. This next section is heavily shaded by trees as the trail meanders along the West Fork working its way closer to the junction with Cathedral Rock #26. Numerous creek crossings are encountered during this section, however they are all adequately cairned and route finding should not be an issue. On my trip I found much of the trail to be covered with leaves, but the path was still well worn and easy to follow. I was not fortunate enough to encounter water flowing through this area in late April, but I imagine it must turn this section of trail into quite an oasis. Time spent in this beautiful riparian area is over all too soon and upon reaching the junction with Cathedral Rock #26 the trail promptly cuts over to the North side of the West Fork and begins to leave this shaded paradise behind. With only 1.6 miles remaining to reach Romero Pass, the trail follows along the North side of the West Fork and begins to switchback as it climbs in elevation. The West Fork quickly disappears from view, shrouded behind trees, as the trail rises above the canyon floor and views of Sabino Basin begin to open up. The top of the final switchback provides excellent views into Sabino Basin, the Rincon Mountains far to the East and Cathedral Rock Trail #23 to the South as it switchbacks its way towards Cathedral Rock. From this point forward the trail winds its way through a vast hilly area with little to no shade. The trail occasionally crosses several small washes that feed down to the West Fork as you wind your way closer to Romero Pass. After reaching Romero Pass you have the option to take Romero Canyon #8 down to Catalina State Park or follow Mount Lemmon Trail #5 up to the top of Mount Lemmon. Coronado FS Reports At the end of Sabino Canyon Trail #23, if you choose to continue deeper into the Pusch Ridge Wilderness, you have a choice to proceed one of three different ways. One of those choices is to follow Sabino Canyon farther upstream in the direction of Romero Pass and the West Fork. Along this route, you'll be able to enjoy more of the desert oasis supported by the water that flows above and below ground in the Sabino Basin. After the trail drops down to the creek bed from the Sabino Canyon/West Fork trails junction, it wanders close to the creek for a considerable distance. There are several perennial pools here and a healthy community of riparian vegetation, as well as excellent views of Sabino Canyon. Trail conditions are good in the basin and the trail is easy to follow, but creek crossings can be hard to negotiate when the water is high. After crossing Sabino Creek for the last time, the trail begins climbing gradually up West Fork Canyon. The trail stays with this smaller canyon for a considerable distance before it climbs out of the canyon for the last time. It then traverses and switchbacks its way toward Romero Pass and a junction with the Cathedral Rock Trail #26. Cathedral Rock Trail provides a connecting route to a number of other Pusch Ridge Wilderness trails, but it is hard to follow and not recommended for inexperienced hikers and equestrians. 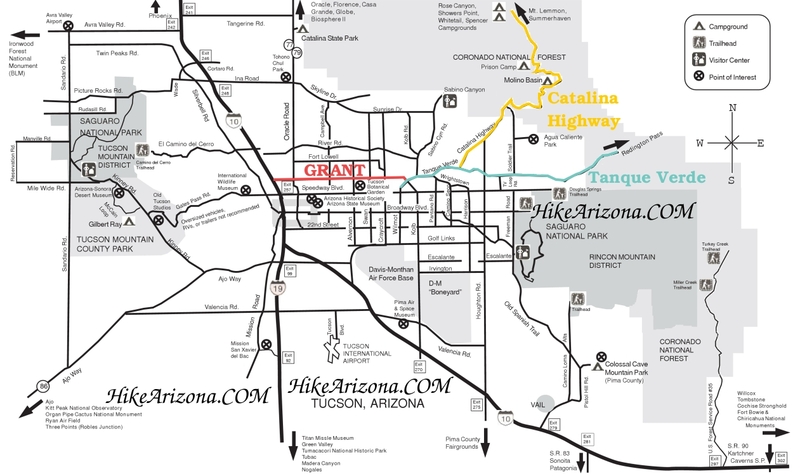 Attractions: Access to upper Sabino Basin, creekside trail, wildlife, good views of Sabino Basin and it's a segment of the Arizona Trail. Shortest access to trailhead is by parking at Sabino Canyon and hiking 3.2 miles up Sabino Canyon road or paying $7.5 to take the tram. From the end of the roadway take Sabino Canyon #23 2.5 miles to West Fork #24A. 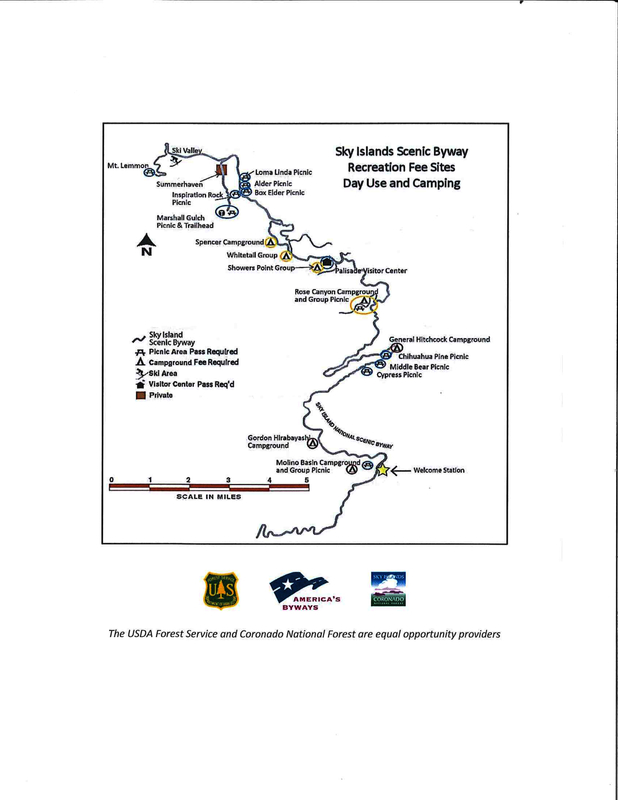 Access from Catalina State Park involves hiking 6.6 miles along Romero Canyon Trail #8 to Romero Pass. 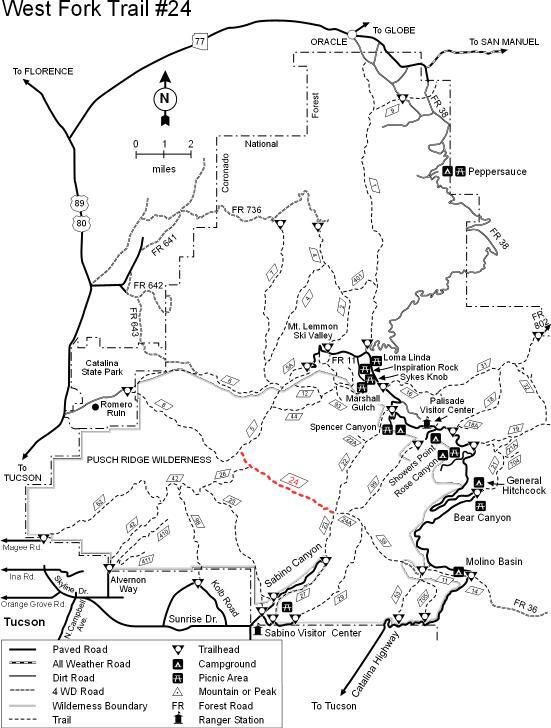 Access from Mount Lemmon involves hiking 5.8 miles along Lemmon Rock Trail #5 to Romero Pass.